Displaying my son's art this way works for me. Stop by Rocks In My Dryer for more great Works-for-me-Wednesday tips. What a neat idea! He must be proud of his artwork. Have you ever tried velcro dots? I don't think they would hurt the wall, and you could center the picture. Got this idea from teaching preschool. 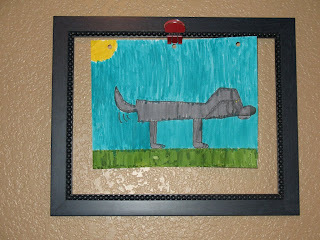 I have seen ideas using a picture frame for kids' art, but not an open picture frame which makes it easier to rotate the artwork. This is a great idea - I'll have to file it away for using when my daughter is older. Thanks for the tip! What an awesome idea - I love it! I frame my two and half year olds artwork around my house, but I really like the open frame so I can switch art out easily - thanks for this! 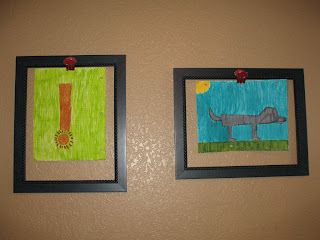 we've been looking for a way to display our kids' artwork in a way that is easily changeable--thanks for the tip. i can't wait to try it! i enjoyed looking at your blog when i arrived her via wfmw. p.s. sorry if this is a duplicate comment, something weird happened the first time i tried to post it.